Sometimes I just need salad. Not often, but it happens (I have to consciously choose to eat my leafy greens). This salad is colourful, crunchy, hearty enough to eat as a meal or fun to serve as a side with Mexican food. 1 cup corn niblets (I use frozen corn and just let it defrost). Add all the salad ingredients to a large bowl. Toss with the salad dressing and enjoy. If you do not dress the salad or add the tomatoes, this salad will last covered in the fridge for 2-3 days. Just add the dressing and tomatoes before serving. Omit the lettuce and this salad makes an amazing creamy, beany salsa to eat with natchos. My recipes is closely based on one I read on Buzzfeed, but I modified it to lower the fat in the dressing and turn up the heat. Buffalo wings are one of those things that people go gaga over. I don’t think folks are actually that excited about the sad, bony, cartilaginous bits of chicken death, but rather they love the hot and spicy wing coating and the creamy and crunchy blend of dip with celery and carrot sticks. I’ve recreated all the goodness of Buffalo wings with hot sauce, ranch dressing, celery and carrots and added fibre, minerals, micronutrients and a big old dose of compassion. Try this! Turn the oven on to 400F. Mix the hot sauce, garlic powder, oil and salt in a bowl and toss the chickpeas in the dressing until they are coated. Turn them out onto a cookie sheet. Do NOT pour any remaining dressing that’s in the bowl onto the chickpeas, but just set it aside. Bake the chickpeas for 20 minutes. Remove them from the oven, give them a stir, pour the remaining hot sauce dressing on them and then return them to the oven for another 40 minutes. When they are done, just let the chickpeas cool on the cookie sheet. You can make the roasted chickpeas ahead of time and store them in a sealed container in the fridge for 1-2 days. While the chickpeas are baking, mix the kale, carrots and celery in a large salad bowl. Add the roasted chickpeas. In a small bowl, mix the dressing ingredients. Taste. Swoon. Add all or some of the dressing to the salad (depending on how creamy you want it). Toss everything together and serve up your Buffalo wing salad. Enjoy! *Here’s how I always have “fresh” herbs on hand. Store your fresh, clean herbs by the bunch in the freezer in freezer bags. Whenever you want fresh herbs for soups, sauces, stews, dips or dressings, just take some from your frozen supply. You won’t even need to chop – just crumble the frozen herbs. Frozen herbs do not work well as garnishes. If you like creamy, garlicky Caesar salad dressing, pay attention. This recipe comes from Esther’s Kitchen – Esther being the wonder pig. My embellishments are the kale, chickpea croutons and a sprinkle of nutritional yeast. Get out your blender and let’s get started. TIP – check prices. It’s December in Canada and a big head of local, organic kale costs less than the imported romaine so this salad is got the nutrition boost of kale. Mmm. Salt and pepper to taste. I used about ¼ teaspoon each. Put everything but your salad greens into the blender and blend until creamy. You will have a thick dressing, but it should not be a paste. If it is, add a bit more water and keep blending. Put your greens in a large bowl. Pour the dressing over top and toss well. I added roasted chickpeas (see recipe below) and a sprinkle of nutritional yeast. Toss all the ingredients together in a cup or small bowl. Place on a baking sheet and bake at 400 degrees for about 20 minutes. Let cool before eating. When they are done the chickpeas will be almost melt-in-your-mouth crunchy; they won’t have any chewiness/moisture to them. If they don’t have that texture, roast the chickpeas for another 5-10 minutes. It’s September 1st and the garden is bursting with goodies: yellow and green beans, savoy cabbage, potatoes, carrots, onion, green pepper, cucumber and tomatoes. Summer is having a hot and steamy farewell this week so I opted for a quartet of salads for my dinner. My mom’s potato salad (on the left). Each recipe makes about 3-4 servings. 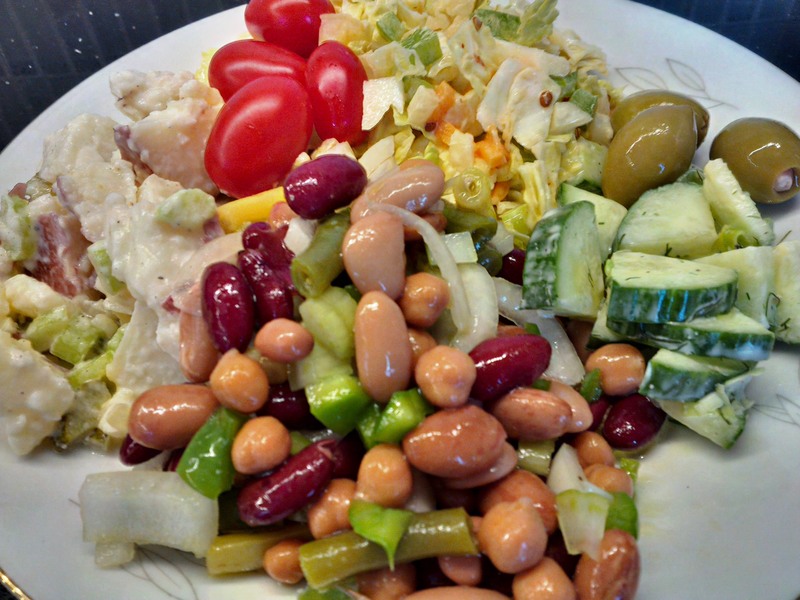 Each salad is better after sitting overnight but you MUST let the bean salad sit overnight or you won’t get the full flavour effect. Toss all the ingredients together in a large bowl and enjoy! I like this salad with roasted tofu too and a few chow mein noodles. Note – if you have radishes they are great in this salad too and add pretty colour. About half of a large English cucumber. Do not peel. Cut into quarters and then slice. Toss all the ingredients together in a bowl and enjoy! Cut the stem end of the beans off and put the beans in boiling water until they are cooked – about 5-10 minutes. Drain the beans and let them cool. When the beans have cooled, cut into 1” pieces and place in a bowl with all the other ingredients. Toss everything together and let marinate for a few hours or overnight. You really must let this salad marinate! In a large bowl toss the potatoes, onion, oil and pickle juice together until the potatoes and onion are coated. Add the remaining ingredients and toss together. p.s. My mom would not be happy that I shared her recipe. She would be delighted that we’re all still gushing over her potato salad though.